Well, here we are. My thirty day nod to Nigella has come to an end. Granted it was a stupid idea in light of Project Boombalardy, but my goodness it’s been fun. I’ve come to realise that yes, the woman is partial to saturated fats and chocolate but she is so much more than that. 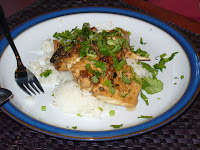 … Continue reading "Ode to Nigella 30 – Salmon with ginger, soy and rice vinegar"